Back to School for many kids means the excitement of new shoes, new clothes, new school supplies, a new lunch box, and a new backpack, along with the anticipation of a new teacher and school year. Back to School for teachers can also mean new shoes, a new outfit or two, or a new hairstyle along with that same sense of excitement and anticipation. Back to School for teachers might also include new classroom decor and brightly colored containers for organizing. I always enjoyed having a new designer clipboard (for holding my daily plans) and fancy file folders. Teachers Pay Teachers would love for you to envision the Best Year Ever! With that in mind, there will be a site wide sale August 1st and 2nd, to help get you started. I’ll be offering 20% off all my resources, including bundles, through August 3rd. 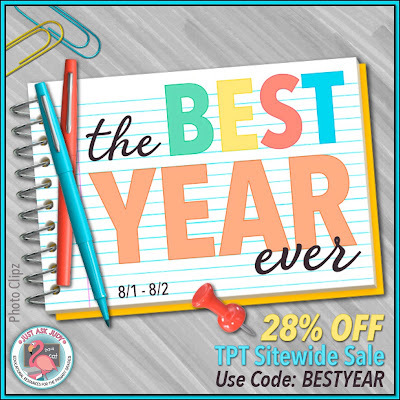 Use the code BESTYEAR for an additional 10% off (for a total of 28%) on August 1st and 2nd. I have been searching high and low for the best teaching resources ever on TpT. I’d love to hear about the best one you have found! « Subtraction is NOT Just Take Away!